Happy October! This has got to be one of my favorite months. Fall, football season, Sessy and Bro’s wedding anniversary, Meghan’s Birthday, Halloween, Ashley’s wedding and my last full month of marathon training! I have also added a new “page” called Workouts where I am going to try to keep a list of my weekly workouts. Check it out, and yell at me when I write “off” too many days in a row:) Also the Gear page and Recipe page have been updated! Today I was able to drag my tush out of bed for an 8 mile pace run at 5am…I did it on the treadmill again while watching my fav “How I Met Your Mother”…it is so convenient that we have a nice little gym at our apartment complex. I just walk the 15 feet and I am inside a cozy gym on the treadmill. I have been kind of freaked out about running outside…I am mostly scared of bushes…see the post about RR’s Eye! There is something about running 8 miles on a fall Monday morning (even if it is in the confines of an apartment gym)…it makes you feel awake and ready to get the week going. I also was feeling pretty motivated, aka I needed an excuse to ditch my grad work, so I headed to BodyPump. I haven’t really been lifting now for about 2 months, although the CXclass does use resistance tubes and the occasional weighted plate tricep work…but mostly I have been laying off the weights. I use to take this class a lot at my old gym in Reading but I stopped because I had this idea in my head that lifting was “bad” for runners…now I just think I was being silly, after reading my Runners World magazine I should be doing some lifting. I know I don’t want to get bulky before the race but I would like to burn some extra fat and build a little muscle before November (taper) hits. I apologize for the crappy pictures! I arrived with 5 minutes until the start of class and I had very little time to set up and the class was packed…I couldn’t be taking my usual obnoxious pics, sorry gang. The set up is a barbell, with weighted plates…I use 5lb for warm up and then add a 2 1/2 pound plate to each side for a 7 1/2 pound lift on each side. Also, grab some extra plates for shoulder work, a step bench (2 risers) and a mat for abs. I go very light, because like I said I am not trying to be a muscle woman (at least for right now). 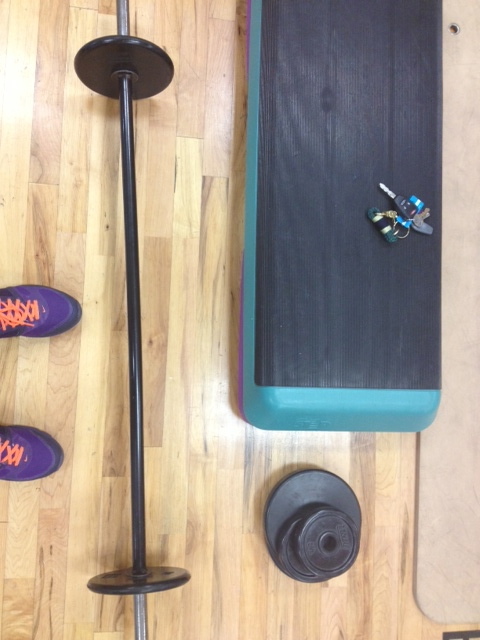 When I am done running I might go up a little bit in my weights if I feel I am ready. 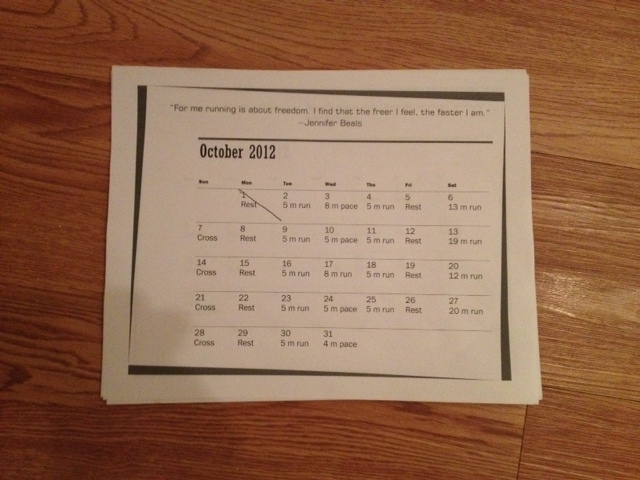 My running calendar! It seems like just yesterday this puppy was on July…but now we only have one more month left after October. It is incredible to think I could barely run 5 miles at the beginning of my training…now I can do 18. boom. (and yes, we do have a 20 miler on October 27th…I think we should dress up…let’s see what RR thinks about that one). Have you ever taken body pump? Have any October goals you want to share? ?